Vendulka opened her shop with her partner Olivier in 2011 on the Isle of Wight. After four lovely years of creating and teaching, they decided to move their business to the mainland and settled in the picturesque village of Monks Eleigh in Suffolk. 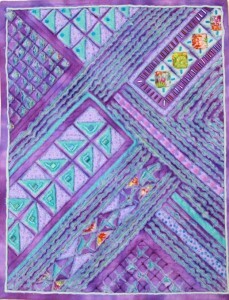 In her textile art, she is using surface design techniques using Markal Paint sticks, Marabu Liners, painted Bondaweb, foil and much more. She continues to teach in her shop as well as giving talks and workshops to local groups. Journey with OliVen – she will talk about her journey – how a girl from the Czech Republic became a quilt shop owner and tutor in the UK. 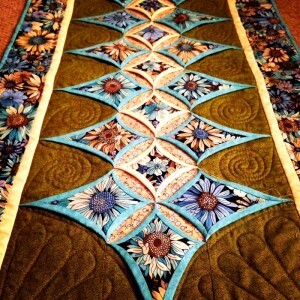 She will present a selection of quilts from the first one she made, family quilts, award-winning quilts, selection of Cathedral window quilts and the latest art quilts. My love of Cathedral windows – in this talk she will explain the difference between the traditional technique (Lynne Edwards way) and her way of piecing it on the machine. She will include 30+ projects made with this technique including award-winning Moonlit Garden. Textile art techniques – She will talk about the techniques she’s using in her textile art – Marabu liners, painted Bondaweb, foils, image transfer, raw edge appliqué etc. and support it with a large selection of samples and finished hangings. Several layers of fabric which are cut through to reveal the different layers and creating a pattern on the fabric with stitch and scissors. 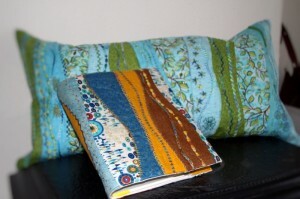 If you like creativity and playfulness with fabric, this is the class for you! Marabu liners come in metallic or glitter series, are easy to apply and are washable. They are a wonderful way to enhance your appliqué, bring out your quilting or to add text and some sparkle to your work. Have you ever tried to paint a Bondaweb and apply it to the fabric? You can cut it in any shape and work with it as you would with appliqué shapes. And what about working with foil which brings bright metallic sheen giving your work interesting effect. 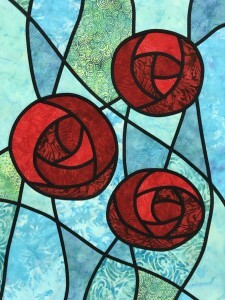 I piece my cathedral windows with a sewing machine which allows me to create more striking colour combinations – the background fabric can be different from the one framing individual windows. 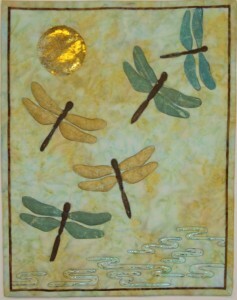 I have several different designs from simple cushions to more intricate wall hangings. 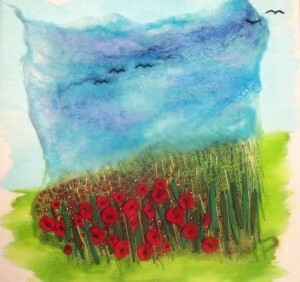 Poppies are such a lovely symbol and are admired by many. In this workshop, we will use a handmade felt background to bring in some very simple machine and hand embroidery to create this wonderful picture full of depth and texture. 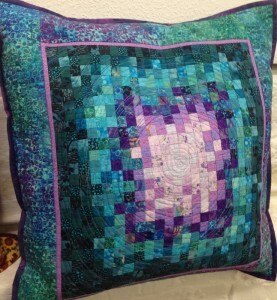 After this workshop, you will save every tiny square you have left from your sewing as I will show you very effective and quite fast and simple way how to turn 1” squares into wonderful cloth which can be used as a cushion, wall hanging or book cover. We will create beautiful cloth using gentle curve piecing, fancy stitches you have on your sewing machine and hand embroidery (optional). This cloth can be then turned into a book cover, cushion etc. 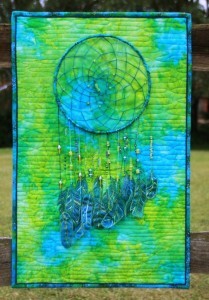 You will learn how to weave dream catcher, we will also use organza and stitch to create the feathers. 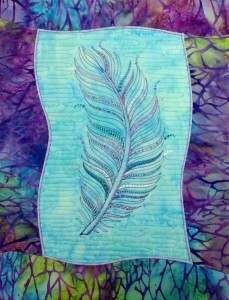 You will then have the option of keeping it loosely hanging or attaching it to the quilted background. Let’s take traditional technique and give it more modern look. I will guide you through designing your own or you can use one of my designs. You can find all this info including photos in this PDF file - click here to open in new window.